The ALLWEILER® and IMO® three-screw pumps are rotary‚ self-priming positive displacement pumps. The pumping elements consist of three moving parts: the power rotor (main screw) and two symmetrically opposed idler rotors‚ all operating within close fitting housing bores. The incoming process fluid is conveyed by the rotating power rotor by means of the cavity formed with the intermeshing idler rotors. These two hydraulically driven shafts‚ which only make rolling contact with the power rotor‚ regulate the amount of internal slip. 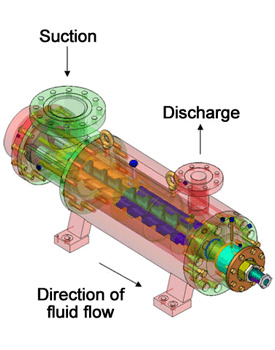 From suction to discharge the fluid is transferred by means of a series of constantly forming and re-forming chambers until it reaches the casing outlet. Symmetrical pressure loading on the power rotor eliminates the need for radial bearings to absorb radial forces. The idler rotors generate a hydrodynamic film which provides radial support similar to journal bearings. Axial loads on the power rotor and idler rotors‚ created by differential pressure‚ are hydrostatically balanced. By this design arrangement high differential pressures can be managed. To achieve higher flow rates‚ double ended or double suction three-screw pumps can be applied‚ with the flow pattern being the same as a two-screw pump.